This is one of many “I told you so” posts I expect to write on Obamacare and the launch of Healthcare.gov. As of this week the picture I predicted would come true is coming true – with force. Healthcare.gov was the first big deployment of Obamacare, the flagship of what was to come in government run healthcare. And it has more than demonstrated the quality of what government-run, risky schemes can produce. H/T Erika Johnson at Hot Air. Reducing error rates are they! How long will this take? On the backdoor, the 834 connections, I had one client tell me they saw some improvement in the error rate, so I checked with three other clients, and they said they hadn’t seen any improvement. EK: Let’s go back to the 834s for a minute. This sounds like it should be an easy problem to solve. The 834 standard is widely used. It’s not particularly complicated. What’s going wrong? BL: I don’t know. This process is decades old. Every union and every self-insured employer who contracts with an insurance company uses it. It’s like a 74 Ford pick-up truck. There’s nothing complicated about it. The ‘residency issue’ is huge. 900 problems identified! A properly designed and tested system would not be this bug-ridden at launch. First and foremost you need to define all interfaces and get them on a coherent schedule. Then you have to model all state and federal sources of data (i.e., define how each one labels common information and create a Rosetta stone to relate each existing label in those data sources to a common definition, like “first name”) and then you need to model all data products (each state and each insurer in the state has unique definitions for data as well). And of course, data modeling and translation is one of those things HHS/CMS tailored out to save time. [In the above diagram] R = Recommended, which in tight programs means it won’t get done. 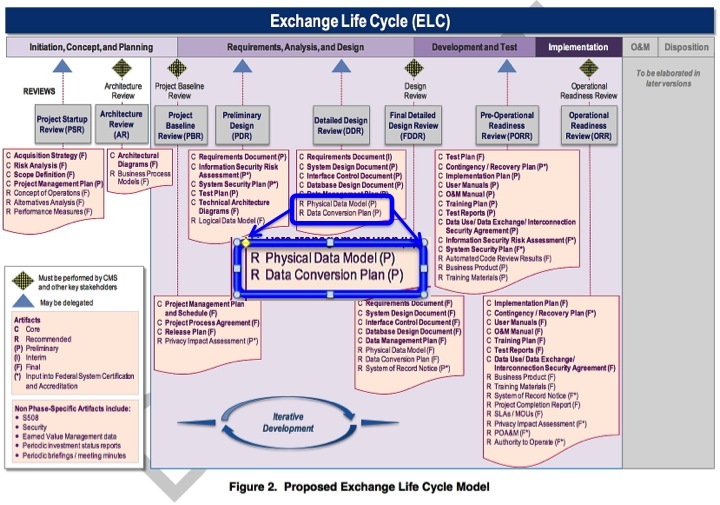 “In the end…the White House quashed the diagrams,” which prevented states from learning about how the administration wanted the insurance exchanges to be designed. No detailed data model, no concept of operations and a late effort to slap on IT Security features (which need to be designed in from the beginning). Plus a fractured contracting mechanism and government civil servants attempting to be system integrator. How could this have ever succeeded? For those not use to these kinds of programs, we are at the “start over” stage. The effort to rebuild from scratch (and doing it right) will be less time and money than trying to salvage this mess. This has happened to many programs who are so far off the rails you cannot recover. According to tech experts, the sorry state of the current website does little to inspire confidence that it can be fixed and functional in less than three weeks. According to Sumit Nijhawan, CEO of Infogix, a data security firm working with private insurers, even if the White House can fix the problems associated with the site, they’re going to find new ones immediately. Nijhawan also warned that the systems that allow CMS and health insurance companies to exchange information are no where close to being ready, meaning tech problems could last years. Yes its a failure, but its still the law and its going to remain that way. The Democrats will never ever ever….turn their backs on their all time biggest accomplishment, govt. healthcare. So we might laugh and say I told you so, but given time the system will eventually be fixed and Obamacare will roll on. Will this help the Republicans in the next election, will the thinking public say, oh yes you Tea Party Guys, your the guys who shut down the government trying to save the USA from this horrible healthcare law, good going I will vote for you. It remains to be seen. Oneal, I agree with you. It’s the law of the land and it’s going to stay the law of the land. once the government starts getting all that money, they’re not going to stop. We don’t have enough TeaPartiers to make a difference. Yes, the Repubs will gain a few house seats and senate seats, but Obama is still the prez and will veto any attempted change. We’re stuck with it. Well lets, think about this. The government was shut down and most people barely noticed unless they wanted to see an open air national monument. Now compare that to: “I lost my health insurance and all I got is this web site that won;t work and a notice of a tax penalty from the IRS”. Yeah, I can see why you think the two are equivalent. Next we can talk about why the shutdown. It was over… hmmmm. give me a minute… Oh yeah, ObamaCare” So, every time a Democrat yells “shutdown”, the answer is “to try to stop ObamaCare”. I like the TEA Party position on this one. Don’t you? O’Neal, I sympathize with your sentiments, but I must disagree with you on this one – and I think that AJ “gets it” completely, because of his technical background. This thing is failing – and not just a little bit. This is not just going to be a “bad” failure, this is going to be the most colossal, catastrophic, and total failure of any program ever undertaken in this nation’s history. I mean that absolutely – it does not matter how much the democrats love it, it does not matter how much they want to fix it – It Can Not Be Fixed. The flaws are so fundamental that only a total scrapping of everything that has been done for the last 3 years and a complete start from scratch would have any chance of success, and Obama doesn’t have enough time left in office to see that through. It Will Never Work, and that means Obamacare has failed. Think about that – it HAS already failed, and now we just have to stand around and watch the thrashing, moaning, and crying of the dying beast, and the wailing and lamentation of the True Believers. The problem as I see it is that the public has bought into this myth that people who think they are smarter than everyone else really can do jobs that require higher intelligence. This started when our schools were integrated. The reasoning was that if you tell people they are not all equally smart it will to irreparable harm to their self esteem and destroy their incentive to even try. What we got was 50 years of social promotions, self esteem enhancement, and affirmative action to elevate the less than most qualified into leadership positions. Since the quasi intellectuals produced by this system think they were smart, have degrees from prestigious universities, and know how to strut around and act like they are smarter than anyone else, it looks like the majority of our dumbed down public think they are capable of doing great things. This Health care fiasco is a perfect example of how these puffed up incompetents get things done. The fact that the Democrat controlled Congress passed this law without reading it is an indication that most of our elected officials aren’t any smarter than the morons who put this thing together. Have you noticed how the supporters of this fiasco personally attack anyone who is smart enough to see that this thing is a disaster and won’t ever work? That is the favorite tactic of people with low intelligence who know how to influence others with low intelligence. Remember how the left wingers tried to tell everyone Ronald Reagan was dumb? George Bush Sr., who had served as head of the CIA and managed to put together a coalition of world leaders in the First Gulf War was also denigrated as being dumb. So was W. Look what the smartest affirmation action leader we ever had has done to this country. His actions indicate he is a moron. But then it would be Racist to put a label like that on him. Everything he has done needs to be repealed so we can start over with a clean state. But then that wouldn’t erase the trillions he has added to the national debt. The other problem from what I’ve been reading is that if the site isn’t fixed sooner rather than later, and those 7 million new health care exchange enrollees aren’t in existence…..the insurance companies will have to determine the next year’s premium increases based on a high number of really sick enrollees and few healthy enrollees and the result will be skyrocketing premium increases. Interesting that you would illustrate the article with a failed missile launch. Turns out that the government was crucial in the development of rocket technology, a development which led to modern satellite communications, among other advances. However, the process was not without setbacks. The memo doesn’t refer to any function of Healthcare.gov that launched October 1, but refers to features not due for implementation until 2014. WWS, I hope your right, but I see this as two issues. 1. The actual law, is it workable? Is the law as written capable of functioning as intended? Yes or No? 2.The technical problem with the Obamacare website. Is it possible to construct a government “website” that can handle the details of enrollment. Let us hope that this failure will usher in the demand for a conservative small government presidential candidate. (not the NJ governor!) and senate, keep the house too! The farce today just emphasizes how bad things are getting. Obama announced a ridiculous plan, that he does not have the authority under the law to order, and which cannot be implemented anyways because it’s already too late to undo the damage, and which would do nothing to fix any of the underlying problems even if it could be implemented. Apparently he announced this in the hope that when it collapses, he may get some mileage out of blaming the insurance companies. It’s Hitler in the Bunker time, right here in the good ol’ USA. Our comment disappeared for some reason. Certainly, you would want to be informed about a factual error in your original post. The technical problems did not refer to anything on Healthcare.gov as released Oct 1, but to features not to be released until 2014. It is interesting that you chose to illustrate your post with a missile failure. The government was crucial to the development of rocket technology, leading to global satellite communications, among many advances. Yet, the process was not without problems. It remains to be seen what will happen with Obamacare. However, one thing that does seem apparent, is that multitudes of people were completely caught off guard by these cancellations. The web site, IMO, is a visual inconvenience. But having your health insurance literally swiped away, without any reason except having a non-compliance with the PPACA, is a rude awakening of monumental proportions! After watching the news conference this morning, though, I am also sensing a real disconnect with Obama and his presidential job. He likes the glitz, the campaign glow, but he doesn’t pay much attention to being the overseer of details. He delegates, and expects magic to be done. And, when it doesn’t happen, he acts confused, disappointed and at a loss…but, never so much so to make any proper amends for his lack of leadership or oversight. Basically, it’s a chaotic mess in DC, and is speading outwards to the people. I only hope that continued pressure is applied by people and politicians alike, that Congress is able to maintain a solid front representing the best interests of the people, rather than the politicos of inside the beltway. I also hope that, within a year’s time, we will be seeing a changing of the guard in DC, a scent of repeal in the air, and an economy that can be taken off of life supports and be allowed to engage in free market pursuits that will be helpful to all those stuck in the despair of a country marginalized and mired down by liberal orthodoxy. Here in Louisiana, our own Senator Mary Landreau is credited with putting Obamacare across the goal line. She is up for election this year and I hope this mess takes her down. The only outcome that matters is that this law is abolished. For that to happen it will take a clean sweep election in the next two cycles. All of this “adventure” reminds me of a story about how, back in the early days of computers, Pacific Telesis, the Bell System spinoff, talked internally about starting a chain of computer stores on the west coast. Our comment reappeared. Thank you!